In honour of St Patrick’s Day tomorrow, I’ll be putting some of those eggs into an Irish Tea Brack or even, if the Husband hasn’t finished off all my Sloe Gin, a Ballyvoddy Tea Brack. If you’re looking for something Irish to make for St Patrick’s Day, I’ve a recipe for a Beef and Red Wine Pie which, with a little substitution of alcohol, turns very easily into a Beef and Guinness Pie. Or you could always turn your hand to some Brown Soda Bread. With this kind of weather, it looks like I won’t be long in the kitchen as there is plenty of digging to be done to get the garden ready for the new season’s planting. Time to join the hens, methinks. FAO Caroline Hennessy.Caroline, my name’s Thomas Noonan-Ganley, and I’m a student of Paul McDermott’s in Rathmines college. I wonder if you’d be able to answer a couple of quick questions (relating to food) via email- for an essay I’m writing?Sorry to post this as a comment; Paul suggested I contact you through the blog-so I am!Kind regards,Thomas. 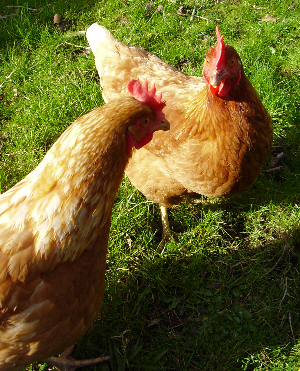 The hens were having a ball that day, lots of sunshine!Thomas – thank you for your message. I’ll definitely be in contact. Previous story What’s going on….